Let’s start with some E-bike ethics. Always be careful while riding uphill on official mountain bike trails. Downhill riders may be carrying high speeds, so always exercise caution to avoid any chance of a collision. Now let’s move over on to skills. We highlighted five main ways to help you improve your climbing skills on your E-MTB. Your perfect body position depends on the steepness of the climb and the terrain you’re riding. When riding gentle slopes, a neutral position is fine. For steeper grades, it’s best to shift your body weight forward to maintain traction on the rear wheel and also keep your front wheel from popping up. Bend your elbows and lower your chest to the bars. Since E-bikes provide an extra boost of power, it’s important to maintain traction with the rear wheel. If the added boost of power is too much, shift to lower support modes. This can make it easier to keep your traction and stay connected with the trail. Choosing the right line while riding trails helps you keep the right pedaling cadence. This is especially important on climbs because you don’t want to stop pedaling and lose your momentum. Look about 5 meters ahead so you know what’s coming. This will help you choose the right line, one that’s smooth and easy to climb. Tires have a big effect on the performance of your E-bike. To make use of your added boost of power, it’s important to have proper traction, which is provided by your tires. Finding just the right air pressure depends on the terrain you are riding and your individual riding style. Your riding style will vary depending on the terrain. When you are riding loose rocks and gravelly conditions, make sure to maintain a steady pedaling cadence on the climbs. This helps with momentum so you can keep moving forward. 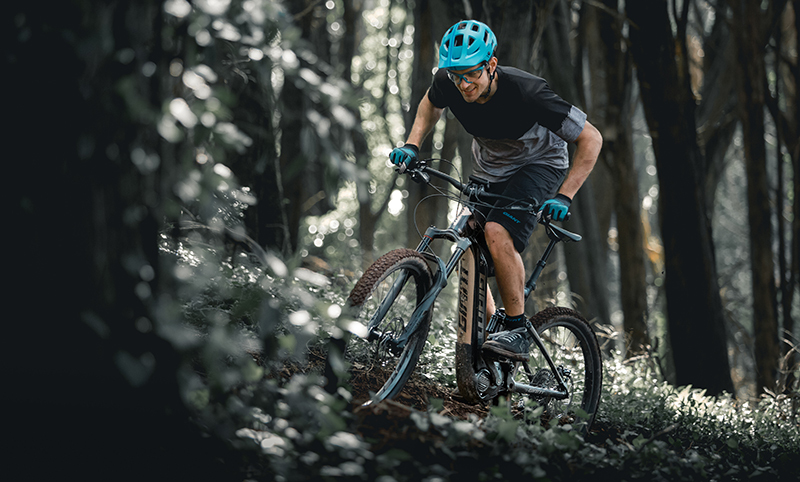 When you’re riding more firm terrain, it’s possible to pedal with a lower cadence as the motor helps propel you forward. Even though you are riding an E-bike, it’s still important to ride in the right gear. The added boost of power helps you on the steepest climbs, but you still have to put in the effort to reach the top of the climb. Always being in just the right gear, with a smooth pedaling cadence, will help.